Shipyard Operations is conveniently located in the main commercial port in the State of Kuwait - " Shuwaikh Port ". The shipyard is ideally placed to execute Ship Repair, Ship Rehabilitation/Refurbishment, Shipbuilding, Professional Diving Services and Supply of Skilled Marine Manpower.HEISCO's skilled and well trained work force, together with modern equipment and a strong yard management team provide the correct combination to ensure delivery on time with the highest quality.HEISCO is proud of its long reference list including local, regional and international clients. Shipyard Operations is conveniently located in the main commercial port in the State of Kuwait - " Shuwaikh Port ". The shipyard is ideally placed to execute Ship Repair, Ship Rehabilitation/Refurbishment, Shipbuilding, Professional Diving Services and Supply of Skilled Marine Manpower. HEISCO's skilled and well trained work force, together with modern equipment and a strong yard management team provide the correct combination to ensure delivery on time with the highest quality.HEISCO is proud of its long reference list including local, regional and international clients. HEISCO's Shipyard is supported with newly modern outfitted engineering workshops that ensures efficient and reliable servicing available at all times. A syncrolift 5,000 dwt With 7 repair bays, ranging in length from 90 to 135 meters, the system is linked by a transfer system. The shipyard maintains a highly skilled workforce that has developed and mastered the techniques in the area of specialized ship repair/ shipbuilding (steel & aluminium) over 4 decades of experience.Our work force is highly efficient, keeping quality and time in their mind always. THE LIST OF SHIPS BUILT IN THE HEISCO SHIPYARD. HEISCO's divers are certified to carry out under water welding, repairs, and in-water surveys using the latest video and still photographic equipment fully approved by most major classification societies. Advanced Brush cart system is used for in water cleaning for all size vessels.The diving support vessel/floating workshop is equipped with L.P and H.P. compressors, decompression chamber, and Air diving Systems, underwater communications, and underwater still as well as video photography. The crew is also capable of underwater thickness gauging, underwater metal detection, underwater burning and welding.The Support Vessel, manned by 16 highly skilled certified crew members has been recently refurbished and equipped with up to date decompression chamber. HEISCO's divers are certified to carry out under water welding, repairs, and in-water surveys using the latest video and still photographic equipment fully approved by most major classification societies. Advanced Brush cart system is used for in water cleaning for all size vessels. The diving support vessel/floating workshop is equipped with L.P and H.P. compressors, decompression chamber, and Air diving Systems, underwater communications, and underwater still as well as video photography. The crew is also capable of underwater thickness gauging, underwater metal detection, underwater burning and welding.The Support Vessel, manned by 16 highly skilled certified crew members has been recently refurbished and equipped with up to date decompression chamber. 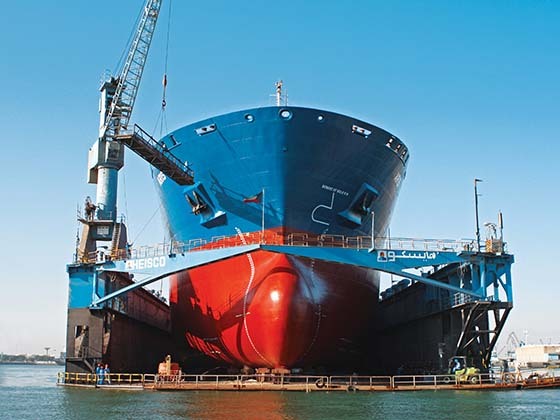 HEISCO Shipyard has five fully equipped Jetties to accommodate alongside/float repairs. Also HEISCO has a specialized team that can attend vessels in anchorage & outside ports limits. Heavy Engineering Industries & Shipbuilding Co. K.S.C. (Public) HEISCO is a major Engineering, Procurement and Construction (EPC) Contracting company based in Kuwait with a diversified range of business in Oil and Gas, Petrochemicals, Power, Pressure Equipment Manufacturing, Shipbuilding and Repair, Dredging & Marine Construction, Major Civil Construction, Maintenance and other industrial services including Heavy Industry projects. HEISCO's commitment to its clients is proven by its quality management system certification to ISO 9001: 2015 and Occupational Health & Safety Management System certification to OHSAS 18001:2007 standards. Established in 1974 to initially meet the demands of the shipping and maritime industry in the Northern Arabian Gulf, HEISCO has since expanded its operations to meet the challenges of emerging markets. Today, in addition to remaining market leaders in the marine industry, we are also recognized as one of the leading industrial companies in Kuwait, having made a major contribution to the development of the country's commercial and industrial infrastructure through successfully completed projects in virtually every economic sector. Just as our diversification continued to grow, so did our reputation for standards of excellence in quality, performance and customer service. HEISCO's highly experienced & dedicated engineers undertake all engineering activities from concept to commissioning related to the following operations with a very high level of professionalism. HEISCO has a Separate business unit that provides technical marine manpower supply. It caters to the needs of our clients for professionally skilled personnel. Kuwait Oil Company – Marine Operations Group.